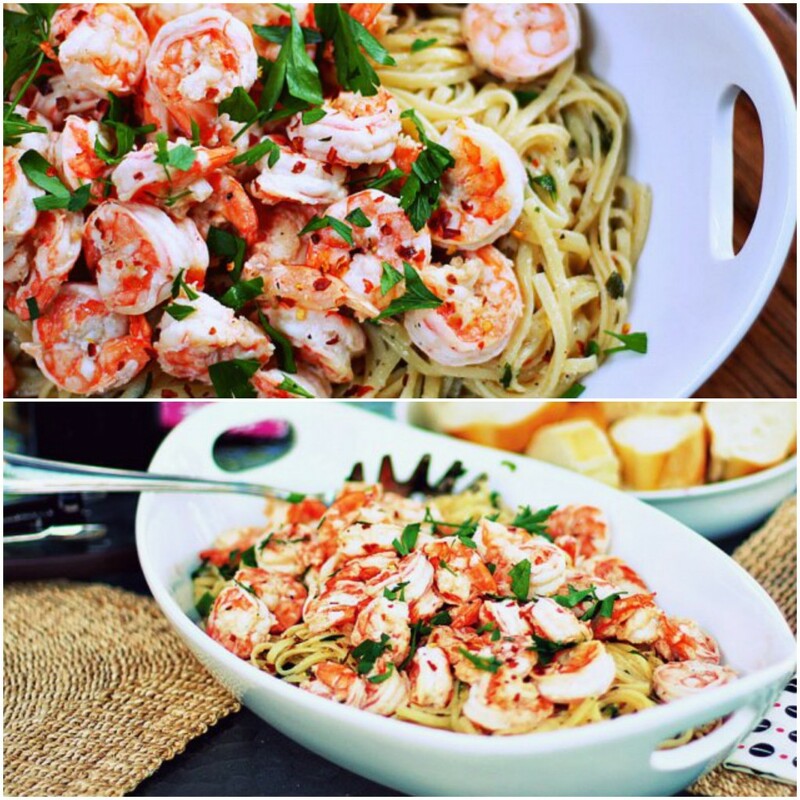 Shrimp Scampi is one of my favorite summer meals. 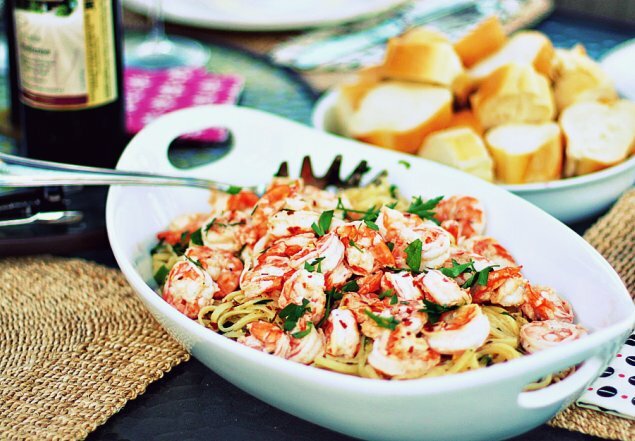 I love serving it over a bed on linguine for a delicious dinner. I love making this dish when hosting a dinner party. I always worry about cooking too much food, or even worse, not having enough. This dish satisfied the bellies of seven adults and my two little toddlers with just a tiny bit of leftovers. The addition of lemon and red pepper flakes made this dish refreshing with the tiniest hint of heat. It was delicious. Fill a large pot with water. Drizzle at little olive oil and some kosher salt in water and bring to a boil. Add linguine to water and cook according to package directions. While linguine is cooking, melt the butter with the olive oil in a large sauce pan to medium-low heat. Add garlic and let it cook for no longer than one minute. Next, add your lemon juice, salt, and pepper. Stir to combine. Add you shrimp to the mix and cook for about 5 minutes (stirring occasionally) just until the shrimp turns pink. 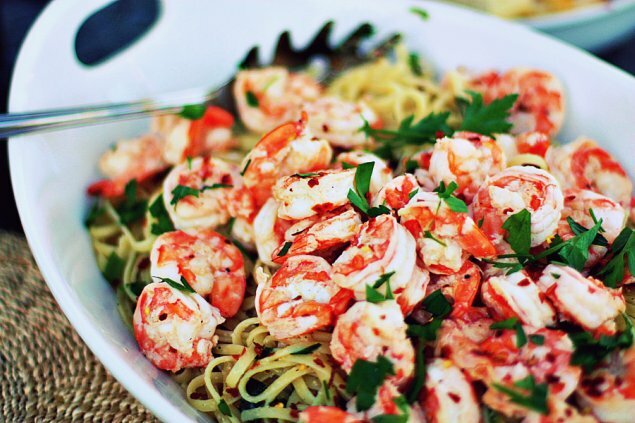 As soon as the shrimp are cooked, remove the shrimp with a slotted spoon and set aside in a bowl. Once the pasta is cooked, drain in colander, then add the pasta to the saucepan containing the lemon sauce. Add the parsley and red pepper flakes to the mix. Gently toss the pasta in the sauce until the pasta in coated. 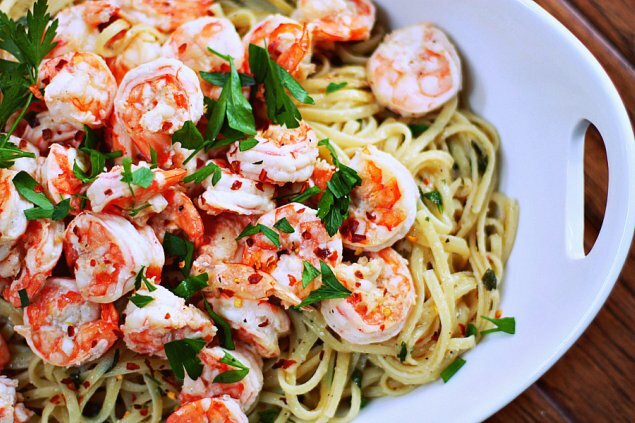 Transfer the pasta to a large serving dish and top with your cooked shrimp. If desired, you can garnish with a little extra parsley. This dish was delicious and perfect meal for a summer evening. I was already making pasta so I made this tonight. It was excellent. Thanks for the recipe! !